(AP) -- Oil has now washed up on the beaches of three Gulf states. How dangerous is it? People should of course stay away from oil on the beach or in the water, but swallowing a little oil-tainted water or getting slimed by a tarball is not considered grounds for a trip to the emergency room, health officials say. "Limited contact is not something that needs to be treated by a physician," said Doc Kokol, a spokesman for the Florida Department of Health. It's been six weeks since the Deepwater Horizon rig exploded, killing 11 workers and pouring an estimated 21 million to 45 million gallons of crude oil into the Gulf of Mexico. Oil has hit beaches in Louisiana, Mississippi and Alabama. And it lurks off the coast of the Florida Panhandle. Poison control centers have had about 45 calls from people saying they think they got sick from oil spill exposure. It helps that the spill involves a type of oil called medium sweet crude. It's considered less hazardous than other forms because it contains fewer toxic sulfur compounds and fewer chemicals that enter the air easily, according to the Centers for Disease Control and Prevention. But oil is considered toxic. Short exposures may cause only fleeting symptoms. But exposure to large amounts of it day after day for a long time could lead to problems with breathing, thinking and coordination, and potentially raise the risk of cancer, said Niladri Basu, a University of Michigan environmental toxicologist. "Avoidance is the best medicine," he said. Children are more sensitive to pollution than adults, and parents should watch for rashes on their skin or dark sticky spots that are hard to wash off, the CDC says. Long-lasting skin contact with crude oil can cause skin to redden, swell and burn. The problem can get worse if the skin is exposed to the sun. Oil on bare skin should be washed off as soon as possible. Call the local poison control center if a rash or other problem develops, health officials advise. Soap and water, baby oil or petroleum jelly are the best way to remove it. Avoid using kerosene or gasoline. If you get oil in your eyes, rinse them with water for 15 minutes, the CDC says. Swallowing small amounts of oil - less than a coffee cup - can cause vomiting and diarrhea, but is not likely to have long-lasting effects, government doctors say. For years bits of tar have shown up on some beaches along the Gulf because of tanker and rig spills and oil seepage from beneath the sea that washes up. Some condominiums, especially in Texas, keep handy tar-remover towelettes for visitors. The oil spill in the Gulf began washing ashore in Mobile Bay, Alabama, Thursday. At a Confederate fort on the white sand beach, reddish-brown globs appeared. Faith Kaiser and Bertice McPherson had brought rubber gloves and plastic bags to take a look and help clean up. "It was just sickening to see this coming. We wanted to see it one more time before it was destroyed," said McPherson, of Mobile. At least 11 oil spill response workers reportedly have become sick in the past week, suffering flu-like symptoms after patrolling the waters off Gulf Coast beaches. But response workers - who are trained and generally have safety equipment - are near higher concentrations of oil, chemical dispersants and other substances. The risk to the landbound public is considered much smaller, health officials say. Neither the CDC nor the Environmental Protection Agency have set up tracking systems for oil spill-related illnesses. States have, but they don't all track cases the same way, officials said. 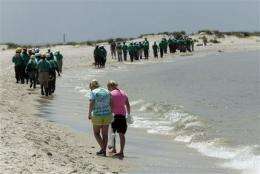 "Neither the CDC nor the Environmental Protection Agency have set up tracking systems for oil spill-related illnesses. States have, but they don't all track cases the same way, officials said." This needs to be done immediately- how else will the long-term effects of exposure to the oil and dispersants be tracked? Otherwise, the incidence of those effects is merely statistical, and therefore no basis for any claims of liability against BP et al down the road. This disaster is going to have effects downstream for many years to come.